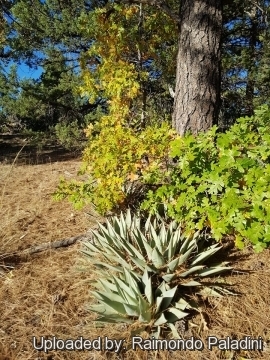 Growing habit in pine-oak-forest at 1400 m asl, near Sedona, Arizona, Usa. Origin and Habitat: Agave parryi has a widespread distribution, with plants found as far north as north-central Arizona, spreading southeast to southeastern Arizona, the mountains of western Chihuahua, and western Durango, and extending into southeastern New Mexico and extreme western Texas. Altitude range: Mostly around 1200-2800 metres above sea level. 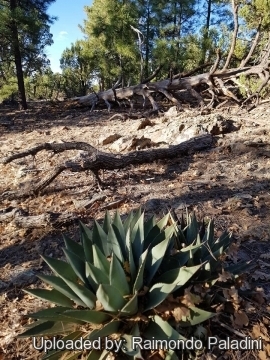 Habitat and ecology: Agave parryi grows in dry rocky slopes in the upper Sonoran region and lower transition zone in grama grasslands, open oak woodland, pine-oak-forest, and chaparral. Its habitat is a relatively cold climate where temperatures frequently drop below 0°C and the ground is often snow. Like most agave species, this plant is monocarpic, meaning that it will only bloom and bear fruit once during its life before dying. 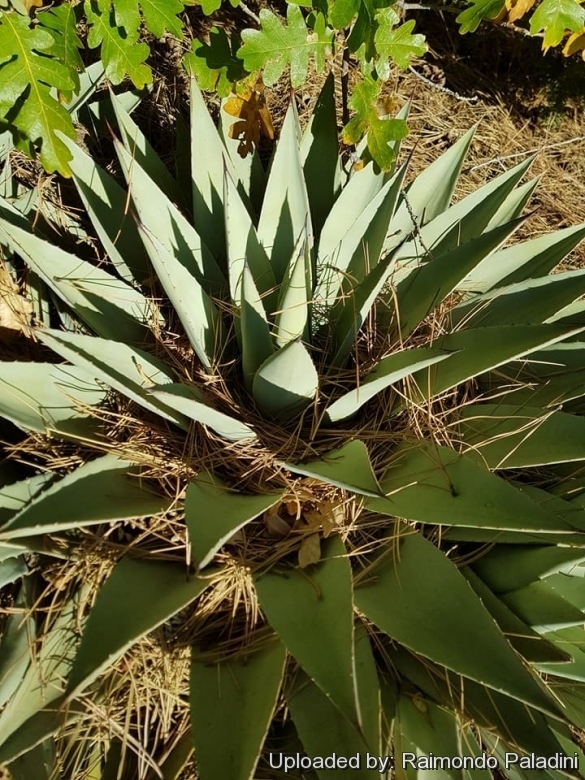 As agaves approach maturity at 10 to 30 years of age, they accumulate a large amount of carbohydrates in their tissues that provide the energy that fuels the rapid development of the large flower spike. This species is pollinated by insects and hummingbirds. 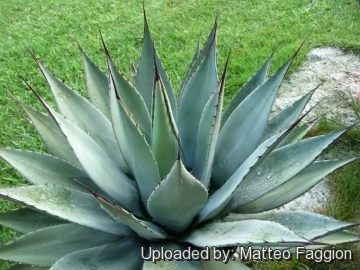 Description: Agave parryi, also known as Parry's agave or mescal agave, is a slow-growing, compact, small to medium-sized agave with grey-green leaves with a dark tan or black terminal spine and with very ornamental imprints of previous leaves on the back. After approximately 25 years plant sends up a 4 metres tall flowering stalk with bright yellow blooms, facing skyward, in large, flattened, terminal clusters; after blooming, it dies, as all leaf and root resources are put into the stalk, flowers, and seeds. New plants already formed on root system take over. It is very variable and all varieties form beautiful, tight rosettes and is one of the more ornamental specie. Rosettes: Compact, globose, “artichoke-like” (35-)40-60 cm tall, 60-75 cm wide, freely suckering, many-leaved. Leaves: 100-160 per rosette, light green, glaucous-grey or greyish linear-ovate, spatula-shaped, concave on upper surface, closely imbricate, rigid, thick, short-acuminate, mostly (18-)25-50 cm long and (4.5-)8-12 cm wide. Marginal teeth mostly rather straight on a nearly straight margin, small, largest above the middle of the lamina, 3-7 mm long, dark brown to greyish, mostly 1-2 cm apart. Terminal spine nearly flat above, 1.5-3 cm long, dark brown to grey with age, decurrent to the 1st or 2nd teeth. Inflorescence: 4-6 m tall, paniculate, stout, part-inflorescences stout, 20 - 36 in the upper half of the inflorescence. Flowers: 60-77 mm long. Buds reddish orange, after opening turn bright yellow. Ovary (27-)30-47 mm long, neck long 6 - 9 mm, mildly constricted and grooved. Tepals yellow, tube 9-12 mm long, lobes subequal, 1824 mm long. Blooming season: Summer (in habitat June—August). Fruits: Pedicels stout 3.5-5 cm long, 1.5-2 cm in diameter, shortly stipitate, beaked, strong-walled. Seeds: 7-8 mm long, 5-6 mm broad, semicircular in outline. Chromosome number 2n = 60, 120. 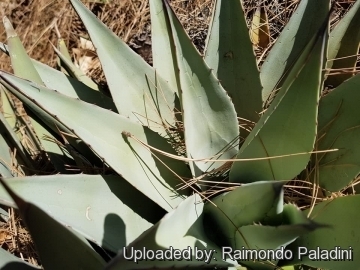 Notes: Mescal (Agave neomexicana, Agave havardiana, Agave gracilipes and Agave parryi). The significance of the mescal in the life of the Apaches of the South-west cannot be exaggerated. The Spanish named the Mescalero Apaches for the food on which they depended so heavily for survival. Mescal was such an important source of food, fiber, and drink that for nearly six hundred years the home ranges of the Apaches coincided with those of various species of agave. The Lipan Apaches relied on Agave havardiana in the mountains of the Big Bend region, and the Mescaleros depended on Agave neomexicana and Agave gracilipes from the Guadalupe Mountains and on Agave parryi into southern New Mexico. 7) Chihuahuan desert plants. 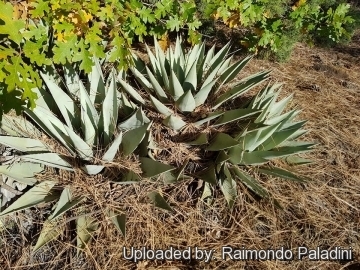 “Parry Agave (Agave parryi)”. 8) Wikipedia contributors. "Agave parryi." Wikipedia, The Free Encyclopedia. Wikipedia, The Free Encyclopedia, 18 Oct. 2014. Web. 2 Nov. 2014. 9) "Vascular Plants of the Gila Wilderness" Presented in Association with the Western New Mexico University Department of Natural Sciences. “Agave parryi Engelmann”. Cultivation and Propagation: Agave parryi is usually cultivated outdoors in rock gardens, in cactus and succulent gardens, in Mediterranean-style landscapes, in borders, or as a specimen. It suckers, but tends to be slow to sucker, so easy to keep control of. Some varieties, like truncata, hardly sucker at all. It is very frost hardy. Because of its compact size, plus its low water use and low maintenance, it is considered a good landscaping plant for desert residential landscaping. Hardiness: Agave parryi is one of the most cold hardy of the agaves, (hardy to -9/-18°C dependin by clones (USDA zones: 9b-11). However some variety (e.g. Agave parryi var. couesii) has proven to grown without particular damages in wet, cold and harsh winters with temperatures down to -20°C or less at least with good drainage). Traditional uses: Used to manufacture mescal and tequila. Native Americans also use plant for food, fiber, soap and medicines. Warning: It is armed with needle-sharp spines. The juice of this species can be irritating to the skin.